There would be no mainstream country music career for Ashley McBryde if it weren’t for the help of Eric Church. The Arkansas native who has just released her major label debut Girl Going Nowhere via Warner Bros. Nashville had been a struggling songwriter and performer in Nashville for 11 years when Church invited her up on stage at the Allstate Arena in Chicago on April 13th, 2017 during a stop of his Holdin’ My Own tour. Of course the moment was somewhat choreographed. It’s not like Church yanked Ashley McBryde out of the crowd randomly and it was one of those storybook “A Star Is Born” moments. Church was already a fan of McBryde’s EP Jalopies & Expensive Guitars, but when the video of Ashley performing her song “Bible and a .44.” with Church went viral, the wheels were set in motion for McBryde to become a major and unlikely force in country music. Eric Church isn’t a guy you would expect to be a big champion of country music’s women on the surface. Of the mainstream lot, his reputation has been built on being the hard-nosed rebel who does things his own way, even if some of this is more akin to marketing than the way Church actually manages his daily business. But quietly, Church has become a champion of many of country music’s most deserving women who in the near term have been struggling for any attention at all, with the success and opportunities bestowed to Ashley McBryde recently being just one example. At the present, most of the men in mainstream country music seem to be obsessed with collaborating with pop divas in hopes of spreading their own names across genre lines and receiving boosts in the charts due to pop radio play. We’re currently seeing this with Florida Georgia Line and their massive single with Bebe Rexha “Meant to Be” out there shattering records. Chris Lane currently has a single surging on the charts called “Take Back Home Girl” featuring pop star Tori Kelley. Keith Urban has a current single with with pop’s Julia Michaels called “Coming Home,” while Kenny Chesney’s collaboration with Pink in 2016 was a big success. Meanwhile Eric Church recently collaborated with roots music stalwart and Carolina Chocolate Drops founder Rhiannon Giddens on his single “Kill A Word.” The collaboration gave Giddens the opportunity at a bigger national audience, a nice little payday in royalties, and an important performance slot on the 50th annual CMA Awards in 2016. Eric Church bestowed a similar opportunity to another critically-acclaimed roots performer when he needed a duet partner to perform his song “Like Jesus Does” at the 2013 ACM Awards. Unannounced, Valerie June appeared on stage for the stripped-down, acoustic performance, wearing a long red dress and buzzing the internet as folks scrambled to try and find out who she was. Eric Church has also gone outside of country and roots for collaborations, yet in the same spirit, reached out to an artist who would benefit more from Eric Church lending his name to them, as opposed to Eric Church being the beneficiary like so many of today’s cross genre collaborations. When Church featured Lzze Hale of the rock band Halestrom on his song “That’s Damn Rock & Roll,” Church was shining a spotlight on another side of music in need of support, which was female fronted rock bands. 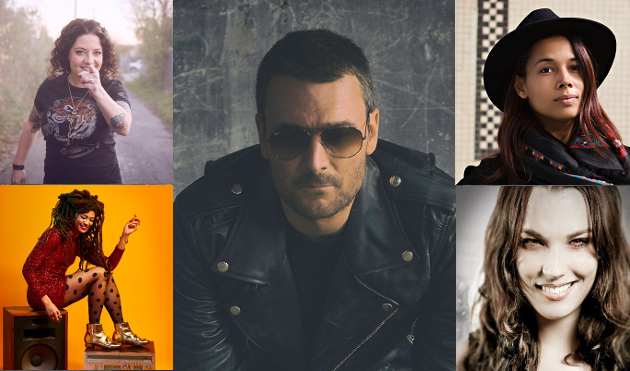 And then there are the artists Eric Church has selected to take on tour with him such as Brandy Clark, Sonia Leigh, the previously-mentioned Halestrom, and others through the years. And Eric Church’s spirit of shining a light on the overshadowed extends beyond gender. His recent appreciation for Ray Wylie Hubbard shows this isn’t just some social justice cause for publicity, but something Church revels in, and sees as a responsibility as a top-level artist. For years, the country music system was one where the bigger artists would champion up-and-comers, and share their audience and spotlight with them so that the next generation of stars could be vetted and supported. These artists were extended this opportunity to them earlier in their career, and they saw it as an important gesture to do the same. It was how the country music farm system kept the genre flush with talent. But today, so many of country music’s top male stars are instead promoting talent on the rival side of the radio dial, and looking to keep their own careers relevant by sponging off of surging interest in pop stars. In the Americana and independent country world, the practice of supporting up-and-comers is much more common. Sam Outlaw regularly features solo women performers both in his band, and as openers on tours, highlighting Molly Parden, Molly Jensen, and Michaela Anne in recent years. Shooter Jennings has recently recorded songs with Eleanor Whitmore and Patty Griffin, he produced Brandi Carlile’s recent record, and has been touring with Jaime Wyatt as an opener while fiddle player Aubrey Richmond is now a permanent part of his band. Call it the Gram Parsons/Emmylou Harris, or Dolly Parton/Porter Wagoner tradition in country music that has gone dormant in today’s mainstream environment, overlooking the legitimacy and depth women can lend to the musical experience. With such a dearth of attention flowing to the women of country, the duet or collaboration with country’s women has never been more important. And it’s also never been more rare, which might be one of the underlying reasons so many women are being overlooked. And while some artists like Keith Urban and Kenny Chesney want credit for championing women’s issues, it smacks more of opportunism than a heartfelt extension of help. Meanwhile Eric Church of all people has been quietly giving a step up for multiple women in country, and in ways that can be measured by their success. It’s up to the women to hold their end of the bargain and make the best of those opportunities just as Ashley McBryde has done by turning in stellar performances and excelling with the opportunities she’s been presented. But it’s also up to male artists to help provide them, now more than ever since women are facing increasingly insurmountable odds. Eric Church also included the performance with McBryde on his “61 Days of Church” playlist. And while on the song he still sings a verse, I’m 99 percent sure the other times he added harmonies was taken out during production to not mess with her voice. While I have mixed feelings about his catalogue, I really respect Eric Church for doing this. In a better world, this is how all established acts would work. Same here, don’t care for most or many of his songs but he seems to do his best to spotlight good music and good musicians. What he’s doing for these new comers, it’s a huge jump start for them. I’ll take that even if I don’t care for his music that much. It’s a respect thing and he just so happens to be very successful in the mainstream circuit. This may be a terrible analogy, but he reminds of Colin Farrell’s character Tommy Sweet in Crazy Heart. While no women were used in that movie, Eric Church really tries to be the middle man to bridge the cap of mainstream and non-mainstream. He seems to play the part well of riding that fence of appealing to both crowds and keeping radio/record executive’s happy. Let’s also not forget the huge spotlight he gives to Joanna Cotten, who sings in his road band. He prominently features her throughout concert performances. Lzzy Hale might be the most beautiful woman on the planet. That picture of her is just stunning. Church has come along ways. Always liked him even when you were critical of him years ago. I had the opportunity to met Eric last year away from music down in Louisiana during gator hunting season. It was one of Church’s bucket list items to do it. Humble guy, kind of of a book worm and is certainly not in the Nash limelight. He lived in a modest home for years. It’s not a social justice publicity stunt. Church is sincere, and isn’t plugging Ray Wylie’s name and inviting him on stage to be cool and hip. Hell Church did more for Ray Wylie then our pals, Austin City Limits which I find it downright insulting that ACL hasn’t done a Ray Wylie taping. I love that Church is a champion of female artists. There are some good female artists out there that need to be heard. Good point. Eric Church has done more to promote Ray Wylie Hubbard than Austin City Limits. Holy hell. The promoting of bands is what I believe has made Red Dirt/Texas country so popular. They treat each other like family and are constantly raving on each other’s music or just by wearing their merch. They constantly collaborate with each other. Cody Jinks is another artist that is doing this as well. Man how I wish Hank III and Shooter could have came together back in the day. Who knows what kind of stellar art could have been created. Did Garth Brooks recently perform “ a girl not going no where “ at one of his shows? Someone told me that but I am not sure . Yes but he just changed it to boy.think it was Spokane, Washington show? He also did it on a studio g episode which he does via Facebook live every Monday night. He credits her previous to the song. Did he get through it without crying like a baby? He didn’t tear up but he was thankful. Just watched it again. Here you go. I will say that actually a decent number of the top male country stars have done more to promote women than the labels or radio. Church, is one & Trigger listed the examples, but Keith took Maren out on tour before My Church for instance, Thomas Rhett included Danielle Bradberry on his deluxe release, and pulled her on stage, with perhaps the notable exceptions of FGL & Luke, I think that I could give you similar examples to Church for nearly all of them….and this is a good thing. I will admit, that this is the one part of Eric’s last tour that bothered me, no exposure for newer artists. There’s a link to it… awesome version of an awesome song. I’m not the biggest fan of his but respect him immensely for doing thiis. In general I guess he just can’t stand most of bropop country, like most people here. His lyrics to Mr. Misunderstood say it all. I feel like he tries to keep his distance from the pop fad, to some degree, and it mostly works, as I’d rather listen to him than most of his mainstream peers any day. Good for him. I always liked him and I like him more now. Giddens delivery in Kill A Word gets to me every time, It’s a great song to begin with and she just put it over the top. One of my favorite songs in recent years. The more accurate title is Eric Church Champions Music of Singers He Enjoys. So… why did we spend so much time bickering about Kacey Musgraves versus Eric Church’s sunglasses, exactly? That wasn’t about Eric Church or his music. It was about different ways male vs. female artist images are judged – a distinction that seems to have eluded a disappointing proportion of the readers of that post. Exactly…what’s more rebellious to the mainstream than championing women in country music? It just goes on and on and on. Enough already. Perhaps the best part about this is is that he didn’t just start doing this after he quit drinking so hard. Even when he was a mouthy drunk around Chief time, he still had Joanna Cotton doing backup vocal. Their best performance to date is “Over When it’s Over,” which might even be his best song to date. Anyway, the point is, there was plenty of good there even when he was running his mouth. This guy is good for country music and music in general. A great post. We need more male country artists following Church’s lead, and far less trying to replicate the FGL/Rexa collaboration.